If you have an allergy to non-steriodal anti-inflammatory drugs and are traveling in a country where you don't speak the language, the last thing you want is a medical emergency where you have to communicate with a doctor or emergency medical staff. 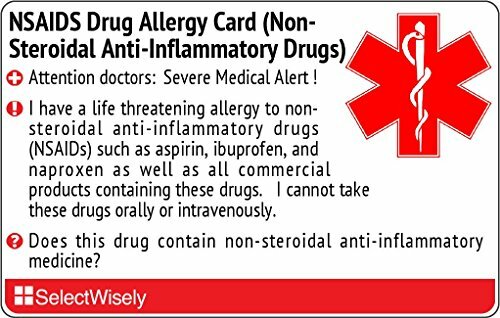 Our NSAIDS Drug Allergy card bridges this communication gap by providing a short, clear message that can be shown to doctors. Each of our NSAIDS Drug Allergy cards are available in various languages such as Spanish, Italian, French, Thai, Chinese and more. Attention doctors: I have a life threatening allergy to non-steroidal anti-inflammatory drugs (NSAIDs) such as aspirin, ibuprofen, and naproxen as well as all commercial products containing these drugs. I cannot take these drugs orally or intravenously. Does this drug contain non-steriodal anti-inflammatory medicine? Please call a doctor who speaks English. Our NSAIDS Drug Allergy (Non-Steroidal Anti-Inflammatory Drugs) Translation Card provided in Italian. If you need another language select it in the 'Flavor' dropdown above. Use in medical emergencies to improve communication. Show the card to doctors or emergency medical staff for immediate medical attention. If you have any questions about this product by SelectWisely, contact us by completing and submitting the form below. If you are looking for a specif part number, please include it with your message.